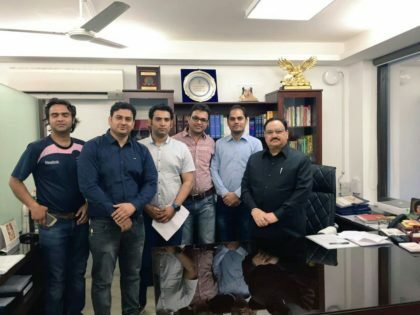 New Delhi: Just two days after 15000 doctors in the capital called for a day long token strike, it is reported that the umbrella body of resident doctors in Delhi, FORDA ( Federation of Resident Doctors Association) was called for an emergency meeting with the Union Health Minister, Shri JP Nadda. The agenda of the meeting- same as the reason for the strike- the 7th Pay Commission. As per sources in the organisation, the meeting started on a positive note after a brief introduction. First and foremost, the health minister was apprised by FORDA representatives about the discriminatory recommendations of the 7th pay commission. “We informed the Health Minister about the Javed A Chowdhury committee (whose recommendations were accepted with applause and implemented except 30%NPA). We also explained him that how the NPA with a history of 94 years , has been de-linked from our basic pay.The Minister assured us to look into the matter.” Dr Pankaj Solanki, President FORDA, told Medical Dialogues. FORDA informed the minister about the urgent need for Indian Medical Services. The Minister is reported to have in principal agreed with the concept and the idea of IMS (Indian Medical Services) and has further asked for a relevant data about IMS from his officials. The Minister was then informed about that how more than 25% of Jobs in the government health sector are lying vacant and the reasons behind those. Another issue pointed out FORDA included how UPSC never releases a waiting list and despite vacancies/jobs, doctors are not made to join. On this point, sources say that Health Minister has assured the doctors that this issue will be resolved soon. The insufficient number of PG seats were discussed, with possibilities/suggestions to tackle this problem being put forward by the organisation. Government of India has notified CCS-RP Rules 2016 under GSR 721(E) dated 25-7-2016, wherein under Rule 7-B (i), it is mentioned that the revised pay would be fixed for doctors by adding Dearness Allowance on the pre-revised Non-Practicing Allowance admissible as on 1st day of January, 2006 to the amount arrived after multiplying the present basic pay by 2.57. It is not clarified what is the basis of adding DA on NPA of 2006 in stead of 2016 on one side and which amount would be taken into consideration in this pay fixation, if the doctor was not in the service in 2006, as he joined after 2006. Doctors need better pay package than reported in the 7 pay commission. Working doctors’ maximum pay is inclusive of NPA with NPA gradually decreasing over the years when the max. pay with NPA reaches 80,000 basic +NPA at present. NPA should not be counted for maximum pay limit as such since it is paid for non practicising.